You can purchase xanthan gum here, using my coupon code (built into the link). Xanthan gum is a soluble fiber produced by the Xanthomonas campestris bacteria. It thickens smoothies, ice cream, homemade salad dressings, keeps your gluten-free quick breads from crumbling, and stabilizes whipped cream for longer term storage. A little bit of it goes a long way, so use a light hand or you’ll end up with pudding-like dressings and sauces. Although xanthan gum is made from fermented corn sugar, it does not contain sugar or corn. 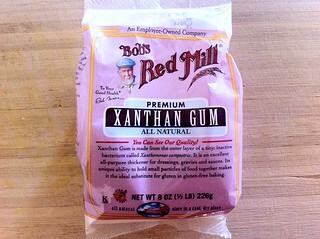 The xanthan gum produced by Namaste Foods and Bob’s Red Mill is gluten-free, corn-free, and sugar-free. Xanthan gum contains a lot of soluble fiber, so you might want to avoid it if you have a special health concern (e.g. IBS). When adding xanthan gum to thicken liquids, start with the tiniest pinch. Whisk it in the xanthan gum, and wait a few seconds for its thickening power to activate When you thicken a hot liquid with xanthan gum, the mixture will become even more viscous upon cooling. Less is more with xanthan gum. If you add too much, you’ll have a slimy mess on your hands! Because xanthan gum is a dry fibrous powder, it will keep indefinitely. A tiny bag will last you for years. Consider it an investment. The title says “what is Erythritol”, however goes on talking about Xanthan Gum.. Fixed. Thank you for catching that! this is an excellent blog. the information is very thorough. Thank you.